Many people travelling on holiday to the west country will be struck by the lunar-like landscapes around St Austell. Huge piles of white spoil dominate the skyline as testament to the historic business that is the biggest employer in Cornwall. 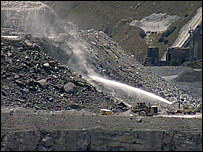 China clay, or kaolin, has been mined in Cornwall for 260 years. The industry employed 5,500 people in the late 1970s, 4,000 in the 1990s, 2,000 in 2006, but now the main employer, Imerys, wants to cut that figure to 1,300. French firm Imerys is to close one of the seven pits it operates in a 25-mile radius around St Austell and transfer a large chunk of its operations to Brazil to save money. One refinery and two drying units will also be shut in Cornwall and a pit at Lee Moor, north of Plymouth in Devon, will also close, along with the refinery and drying unit. 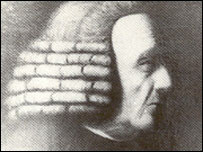 China clay has been mined in Cornwall ever since Plymouth chemist William Cookworthy first discovered its use in 1746. He was looking for something to replicate the porcelain being imported from China when he came across the fine clay material which was then used as a fire-proof liner for steam engines. 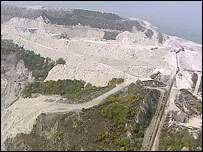 Since then hundreds of millions tonnes of material have been mined in so-called Clay Country - but for every tonne of china clay, nine tonnes rock, sand and gravel waste is also extracted. China clay production really took off in the 20th Century when its myriad other uses became apparent - from paper whitening to fire-proofing to electrical insulation and paint production. Now about 70% of Imerys's annual production of about 1.9m tonnes of china clay from the South West goes into paper production where it is used to make sheets glossy and smooth. The quarrying technique is unusual. High pressure hoses are directed at the wall of the clay pits and the fine clay forms a slurry which is washed down leaving most of the impurities behind. The problem facing the company is that production of the fine china clay for making paper glossy requires huge amounts of energy in the processing and drying. Now the firm reckons that it can cut costs by transferring production to Brazil where the clay will require less processing. Ivor Bowditch, Imerys spokesman, said: "Employment costs and energy costs are about the same as the UK - our average wage is £23,000 and in Brazil it's £18,000 - but the natural characteristics of the Brazilian product are far more simple." The firm's mind has been concentrated by plummeting profits, down from £46m six years ago to a predicted £6.7m this year as well as energy costs which have doubled over the same period. Couple that with the weakness of the US dollar and the firm says it is going to concentrate on what the Cornish pits are good at - the less fine filler kaolin which is use to make paper smooth - and streamlining production processes. Imerys says it is doing all it can to ease the pain, with legal, financial and stress counselling part of its redundancy package. The pits at St Austell still have at least another 50 years life in them on current production says Imerys and possibly another 25 years after the reduction in production which is due to start in November next year.